Although during the winter months between October and February grass growth is at a minimum, there is still lawn care which can be done which can be carried out all year round. During a period of dry days, it is a good idea to mow your lawn a small amount and gradually bring the height down over the cold parts of the year. Lawn aeration remains one of the most important aspects of lawn maintenance. Remove any leaves from your lawn which may be reducing the airflow in your turf. 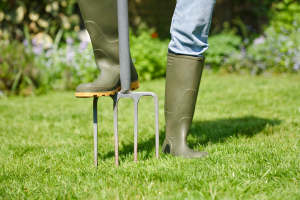 Next punch some holes in your lawn turf using either a garden fork or lawn aerator to allow nutrients, air and water to penetrate the soil and produce a more vigorous lawn. If you do have more time for lawn maintenance, it is an excellent idea to remove heavy dews from the lawn daily or whenever it is needed. Damp, warm days are a breeding ground for disease on your lawn and by removing the dew this will allow the grass to dry and will help in reducing outbreaks of disease. Here at Ivinghoe Turf we have been harvesting and growing high quality for over 30 years. Our hard wearing range of lawn turf is perfect for various scenarios and is used by gardeners, landscapers and builders to create beautiful lawns.